A massive bomb blast has hit government buildings in the Norwegian capital Oslo, killing at least two people and injuring 15 others. PM Jens Stoltenberg described the situation as “very serious”. The bomb was followed by a shooting incident near Oslo at a youth meeting of the Labour Party which Mr Stoltenberg leads. Unconfirmed reports said a man dressed as a police officer had opened fire indiscriminately, injuring five. No group has said they carried out the attacks. 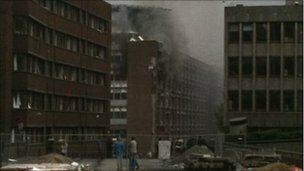 Television footage from the government quarter showed rubble and glass from shattered windows in the streets – smoke was rising from some buildings where fires were burning. The wreckage of at least one car was on one street. Mr Stoltenberg, in a telephone call to Norwegian television, said all government ministers were believed to be safe. He said he had been advised by police not to reveal his current location. “Even if one is well prepared, it is always rather dramatic when something like this happens,” he said. “We are issuing warnings just make sure people are not in the area in case there are further explosions,” he told the BBC. 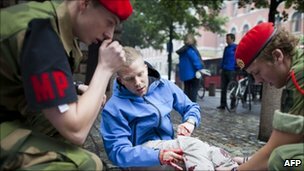 A spokesman for Oslo University hospital said seven people had been taken there for treatment. State Secretary Kristian Amundsen said Friday was a public holiday in Norway so the offices were not as busy as they might usually have been. “But there are many hundreds of people in these buildings every day,” he told the BBC. Reuters said the oil ministry was among the other government buildings hit. Oistein Mjarum, head of communications for the Norwegian Red Cross, said his offices were close to the site of the explosion. “There was a massive explosion which could be heard over the capital Oslo,” he told the BBC. “This is a very busy area on Friday afternoon and there was a lot of people in the streets, and many people working in these buildings that are now burning,” he said. An NRK journalist, Ingunn Andersen, said the headquarters of tabloid newspaper VG had also been damaged. “I see that some windows of the VG building and the government headquarters have been broken. Some people covered with blood are lying in the street,” AP quoted her as saying. Local resident Silvio told the BBC the blast shook everything in his apartment. He said he saw two or three unconscious people being carried on stretchers and others on the floor. Mr Mjarum said people across the Oslo and Norway were in shock.